Sauber's Sergio Perez is to miss the rest of the Canadian Grand Prix after feeling unwell in first practice. The 21-year-old Mexican will be replaced by McLaren test driver Pedro de la Rosa, who ironically was sacked by Sauber near the end of last season. Perez spent two days in hospital after being concussed in a crash during qualifying in Monaco two weeks ago. He was passed fit on Thursday but felt ill at ease during Friday's first practice. "Of course I wanted to drive and I had no doubt I was alright but apparently this is unfortunately not the case," Perez said. "I am deeply disappointed. I spoke to the team after the session and told them that I'm not a 100% fit. I only want to drive when I'm 100% well. I need some more time to recover." 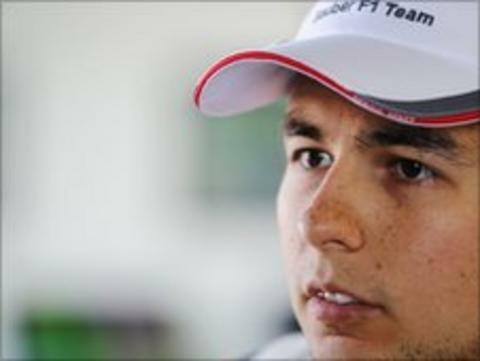 BBC 5 live pit-lane reporter Jennie Gow said she had been told by team boss Peter Sauber that Perez "lacked confidence and wasn't as comfortable in the car as he felt he should be". And commenting on Perez's withdrawal, Sauber added: "Maybe we are being overly cautious, but when it's about the health of our drivers we take zero risks." Sauber' official reserve driver Esteban Gutierrez is in Mexico, although in a posting on Twitter on Friday he suggested he would have gone to Canada had he been aware that Perez would potentially be forced out. "It's a shame to hear about Montreal, hope 'Checo' gets better, but I never received indication to prevent this situation. I was ready," he said. But with Gutierrez unavailable Sauber moved quickly to do a deal with McLaren for De la Rosa, 40, to stand in. The Spaniard is a veteran of 85 grands prix. After seven years away from racing as McLaren test driver, he returned for Sauber last year. He scored six points before being dropped and replaced by current Renault driver Nick Heidfeld for the final five races of the season. "We want to thank Pedro de la Rosa and McLaren for helping us out in this situation," added Sauber.